At Hotel Santa Barbara we take pride in recommending all of the favorite Santa Barbara spots so our guests enjoy an authentic experience. Being conveniently located in the heart of Downtown means our guests have easy access to an abundance of great restaurants, sights, activities and cultural attractions. And our staff does too! 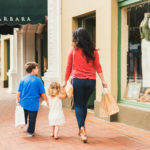 Many of them grew up in Santa Barbara, and some came more recently and have enjoyed exploring downtown, so we went straight to the source to learn more about their favorite Santa Barbara spots. 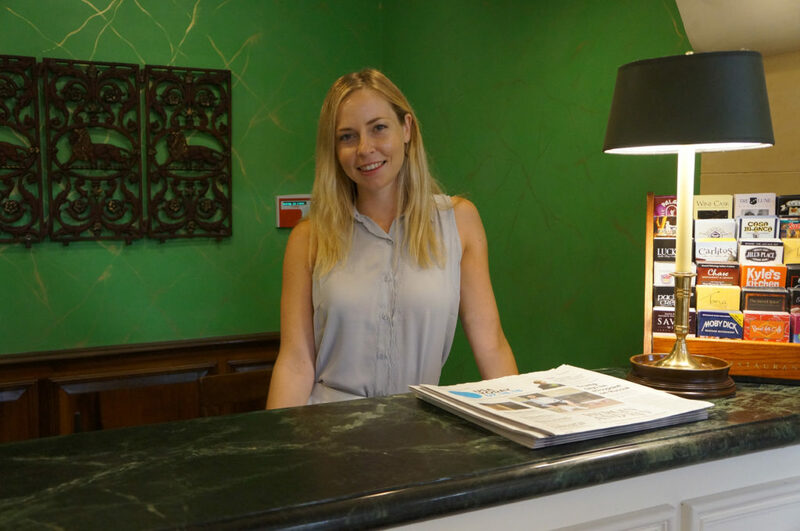 Periodically we will feature different staff members and their favorite Santa Barbara places. What is your favorite part about working at a hotel in the heart of downtown Santa Barbara? 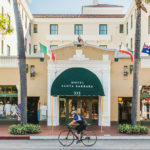 Hotel Santa Barbara’s excellent location puts me in proximity to outstanding coffee shops, restaurants, shopping and theaters. My lunch breaks are never dull! It is so serene and quiet in the Hotel it’s easy to forget that the hustle and bustle of downtown is only a few steps away. Stepping outside feels like I’m entering an entirely different world. What is your ideal restaurant in Santa Barbara for nice dinner out? Most importantly, I want to be near the water. Santa Barbara Shellfish Company on Stearns Wharf always has the most scrumptious fresh seafood and I like the no frills atmosphere. It’s my favorite Santa Barbara spot for seafood! What do you recommend for a fun sightseeing tour or recreational tour of Santa Barbara? First of all, my favorite way to see Santa Barbara is from the water. Which is why I highly recommend the sunset cruises with Santa Barbara Sailing Center or Condor Express. Added bonus: mention Hotel Santa Barbara when you book with the Sailing center and you’ll receive a discount! Favorite wine tasting room or brewery in the area. Margerum Wine Company is my favorite Santa Barbara winery. I’d also recommend trying out Lama Dog Tap Room. You can’t beat the edgy and fun environment that’s inside the Waterline (where Lama Dog is) in Santa Barbara’s Funk Zone. List your top 3 favorite things about Santa Barbara. Drool-worthy restaurants, pristine beaches, and legendary hiking – All within 10 minutes or less of driving! What do you think makes Santa Barbara such a special place to live AND to visit? Santa Barbara really has it all. 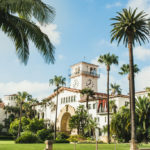 Santa Barbara has history, culture, some of the best restaurants in the world, spectacular vineyards and wineries, all in a friendly small town environment. Even as a resident, I find something new to celebrate every day. 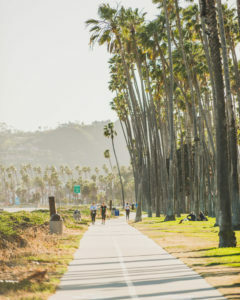 Palm tree lined East Beach with the Cabrillo bike path. List your top 3 favorite Santa Barbara outdoor places and what you enjoy most about them? Santa Barbara’s East Beach. 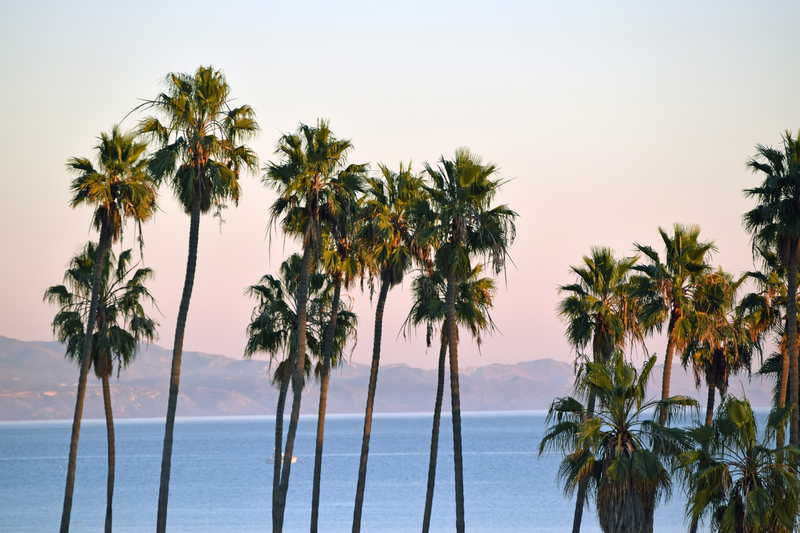 Iconic palm trees line the beach and expansive views of Stearns Wharf and nearby Butterfly Beach in Montecito. Sunsets & sunrises are especially beautiful. The Rose Garden at the Mission. It’s my favorite place to picnic on Saturdays. Hendry’s Beach (Arroyo Burro) is my favorite Santa Barbara beach to find shells, sea glass and explore. Additionally, it’s also one of my favorite places for an afternoon run. Boathouse restaurant is located there and serves a delicious brunch. Check back every couple of weeks as we feature a different staff member and their favorite Santa Barbara spots. Have questions about our Santa Barbara recommendations? Text our 24/7 concierge service at (805) 448-0710.